低倍放大的乳腺浸润性导管癌显示自中央区呈放射状发出的纤维组织。大量纤维组织使得肿瘤呈硬癌的硬度。这样侵袭性癌可能浸润胸壁，使其不活动。 This infiltrating ductal carcinoma of breast at low magnification appears to radiate from a central area of desmoplasia. This collagenous component gives the neoplasm a hard "scirrhous" consistency that is palpable. 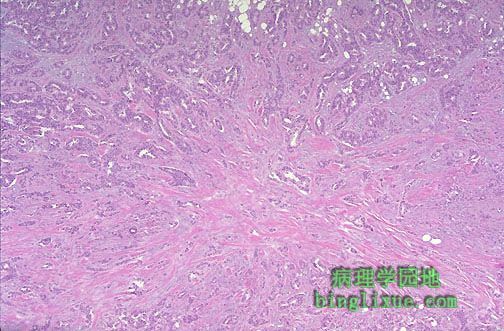 Such an invasive carcinoma may be fixed to underlying chest wall, making it non-mobile.